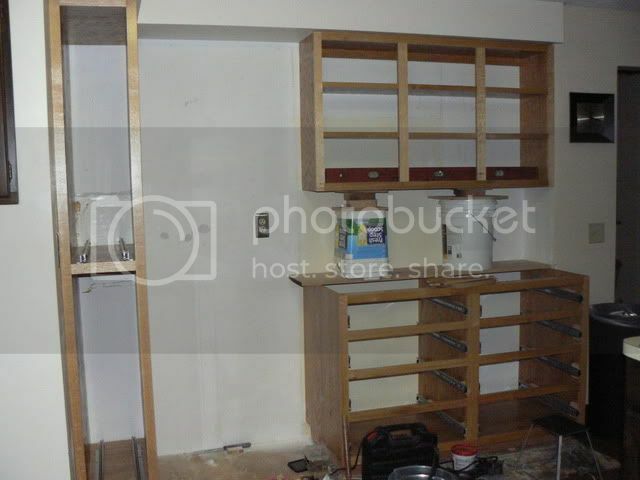 Work has been progressing on my kitchen cabinet project, even though it’s been a fair while since I’ve posted an update. 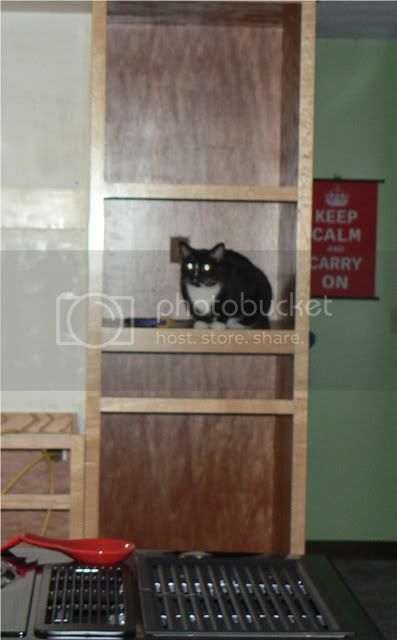 Perhaps the biggest step has been the completion of the final two cabinet carcasses, shown above. These were the largest of the bunch and the prospect of making them intimidated me. I’m glad they’re done. I had intended to make the paneled doors next but decided to put that bit off after becoming frustrated when the doors refused to go together properly. So – now I’m working on the cabinet drawers. 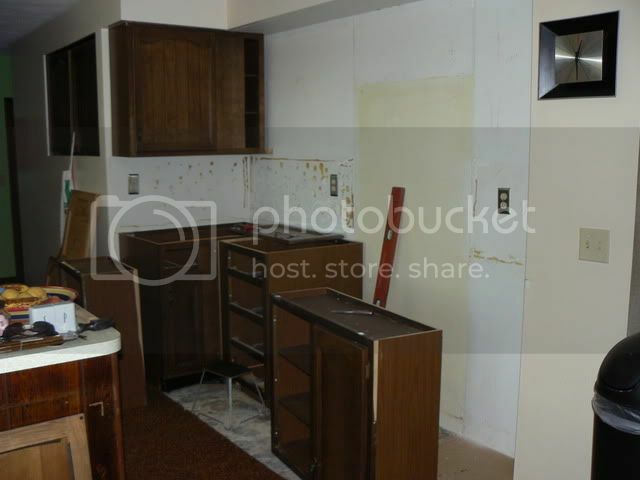 You can see the blanks for the drawer fronts in the foreground of the photo above. So far I’ve got all four drawers made & installed in one cabinet and, just as importantly, become comfortable this the process so the other dozen drawers should (in theory) go together more quickly & easily. There are a bunch of drawers in the cabinets I’m building , seventeen to be exact, and making them has been rather a long process. 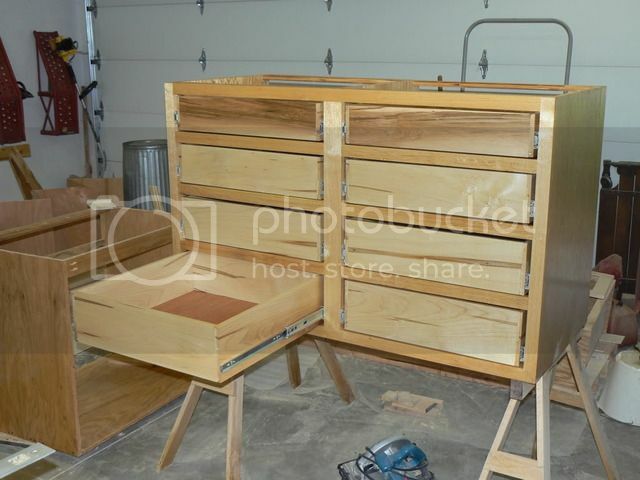 If you look closely you can see that I used solid wood (soft maple) for the drawer boxes. I think the maple looks much better than plywood even if it's less convenient to work with. I also made a point of using full extension drawer slides so things won't be as likely to be lost in the backs of the drawers. Andy's been a big help varnishing the drawers (as well as the final two cabinets)so we are now very nearly done. We just need to varnish and install the last few and then apply the drawer fronts. 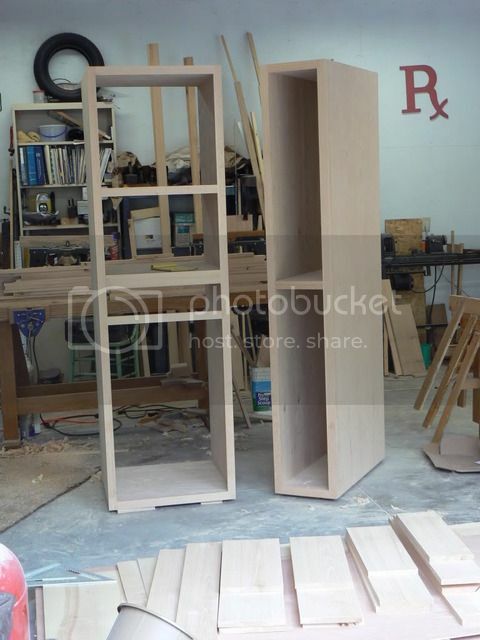 The next step will be to make the pull-out shelves and then the cabinet doors. You know, there just may be a bit of light at the end of the tunnel! 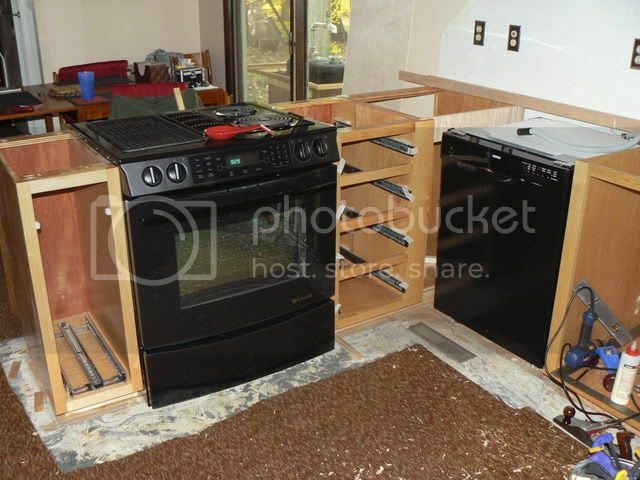 Despite the fact that the original plan was, obviously enough, to have all the cabinets 100% completed before bringing them in we decided to take advantage a vacation week to tear out the old cabinets and install the new even though the doors haven't been completed. 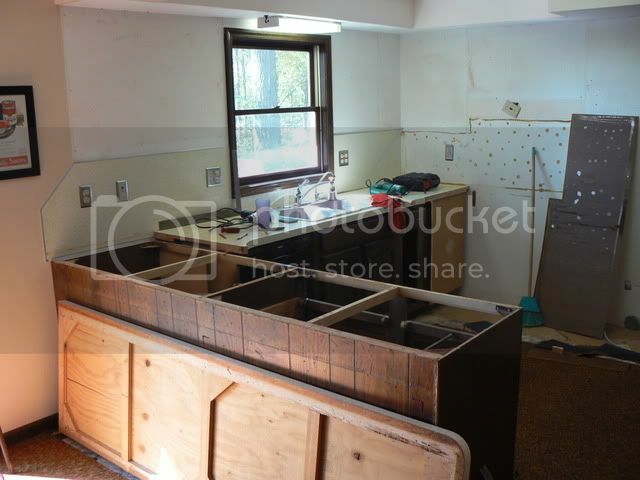 Here's a photo of the old cabinets being torn out. The first three cabinets being set in place for a test fit. 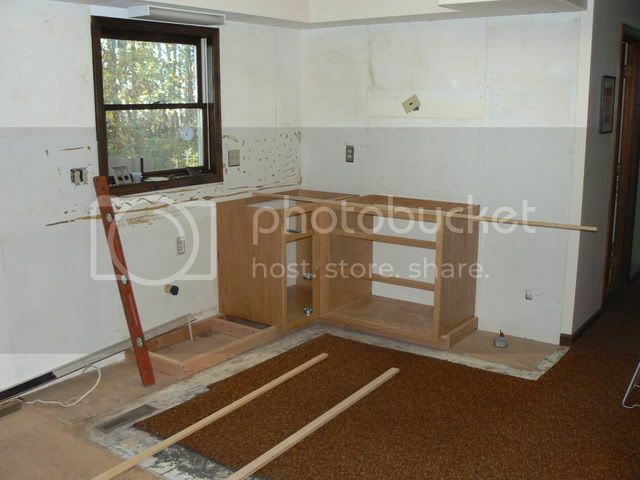 We thought we'd have to completely gut the kitchen & replace the underlayment before we could start installing cabinets but the flooring we chose can go on top of the existing underlayment so we were able to do one side of the kitchen at a time.